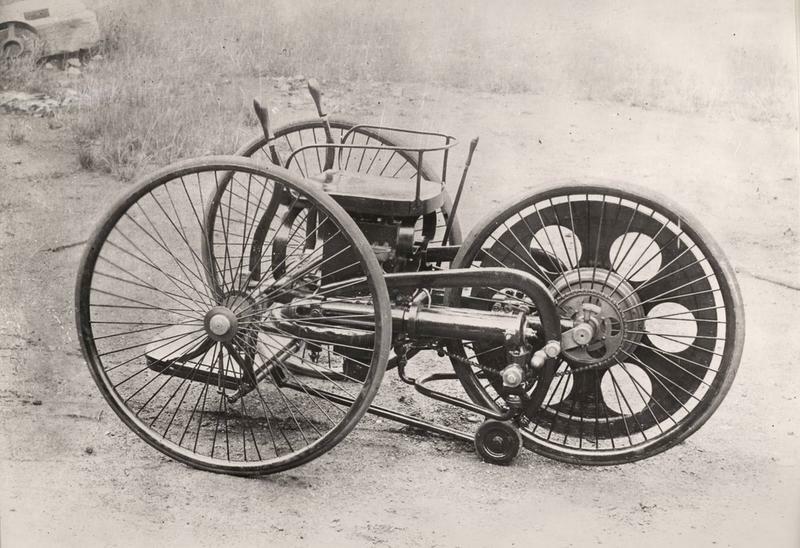 Some consider the first motorcycle to also be the first car – as it was created 2 years before Karl Benz unveiled his invention in 1886 and both were 3-wheelers propelled by a petrol powered, internal combustion engine. Pictured below, the world’s first motorcycle is called the “Butler Petrol Cycle”, it was invented built by Edward Butler in England in 1884. It was powered by a 5/8hp, 600cc twin-cylinder 4-stroke engine, with rotary valves, a float-fed carburettor and Ackermann steering. For those unfamiliar with Ackerman steering (as I was until I looked it up), it’s a method of steering that avoids the issues generated by 2-wheels on a fixed axle needing to travel different distances when turning. The Butler Petrol Cycle is rear-wheel drive, interestingly its inventor didn’t see the need for brakes and so he didn’t fit any. Forward motion was stopped by raising the driven wheel off the ground via a foot-lever, transferring the weight to two castor wheels on either side. Whilst some consider Butler’s invention both the first car and motorcycle, it is generally agreed that it’s the first motorcycle. That said, it was pre-dated by a number of steam-powered motorcycles, so it all comes down to how you personally define what a motorcycle is.